Two new Harper imprints to tell readers about. 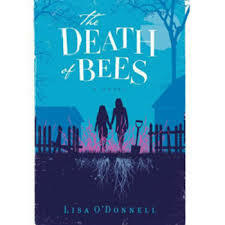 First up is the highly unusual debut novel of Lisa O’Donnell, The Death of Bees. O’Donnell’s screenwriting background gives the novel a visual immediacy of the dramatic action as it unfolds that will draw readers in to this story. This novel is told in rotating narratives, starting with that of fifteen year-old Marnie and her younger sister, Nelly, with their distinctive voices describing their personalities and actions and reactions. The book opens on Christmas Eve in Glasgow’s Maryhill housing estate, and the girls’ have just finished burying their parents. “Neither of them were beloved,” Marnie tells us. In their narrative we learn that Izzy and Gene were far from the best parents, negligent and abusive. Marnie’s goal becomes to secretly take care of Nelly without them entering the foster system. Once she turns sixteen she will be legally be allowed to care for them both. There is a mystery surrounding the death of Gene, although their mother has committed suicide, that hangs over this year’s events. Then their gay neighbor, Lennie, notices the parents’ absence. Grieving over the loss of his own partner, his voice is added to the mix, and the story of the unlikely trio unfolds. Lennie becomes the lynchpin in their little unit, cooking for the sisters, doing their wash, keeping them safe from the system by showing up at Parents Night pretending to be their grandfather. An unlikely friend, Vlad, also coping with his own grief, is added to their mix, and adds to the affecting nature of the story. Marnie’s story is that her parents have left them in Lennie’s care to travel to Turkey. But deals Gene has made before his death soon unravel that lie, and one lie leads to another, until the day the sisters’ real grandfather shows up on their doorstep, demanding to know where his daughter has gone. The characters are gritty and real, with all the flaws humans possess, and with an added dark humor that will have you rooting for these girls. This is a most unlikely family story that is oddly compelling, as it addresses just what family means and what lengths those who love us will go to in order to protect us. 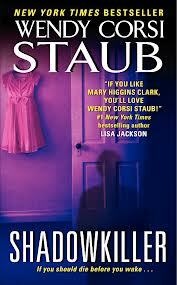 Next up is the third in Wendy Corsi Staub’s trilogy featuring Allison Taylor, Shadowkiller. Allison has had to live through the tragedy of 9/11 while fighting a serial killer in Nightwatcher; but that led to her meeting her future husband, Mac MacKenna. In Sleepwalker, set a decade later, terror entered Allison’s life once again, threatening her family, now expanded to include three young children, in their suburban home. Just when Allison and Mac should be able to take a deep breath, a predator will again enter their life. A stranger’s death in the Caribbean leads to the string of events that seem far unrelated to Allison, yet will prove threatening and connected. Memories of Allison’s troubled childhood bring back that threat as the MacKenna’s travel to the Midwest for a family reunion with Allison’s half-brother and his family. A madwoman from Allison’s past, with ties to Mac, has bided her time to seek revenge on Allison, at one point staying next door to their Westchester home and watching the family’s every move as they prepare to take off on what should be a relaxing vacation. Tapping into their wireless network, the killer knows every move Allison and Mac have planned, and will stop at nothing to bring off the plan she’s hatched to kidnap and eventually murder Allison. Several key characters of the series return, and readers who have followed the books will be surprised at the twist that opens the novel when the identity of the killer is revealed. Fast-paced and filled with suspense, readers have been anticipating this final installment in the trilogy. The Death of Bees seems wonderful, thanks for the introduction.